Oral cancer can be treated if detected early. Your dentist can provide a check-up during your regular dental appointments, however it’s recommended to also undergo a complete oral cancer screening every three to five years. This is particularly important for patients that have suffered cancer in the past and for those aged 50 and above who are at increased risk of developing cancer. If you’re about to undergo your first oral cancer screening procedure, you likely want to know more about the screening process, so we’re offering our guide in this latest post. The oral cancer screening process will include a physical inspection of your cheeks and gums. Your dentist will be checking for abnormalities that might indicate a potential growth, such as lumps or swelling. The dentist will then complete an examination of the floor of your mouth and tongue, as well as the roof. They will be looking for white or red patches, or any kind of or abnormalities such as sores or lumps. The dentist will then inspect the lymph nodes for tenderness and swelling. This is a critical indicator that your immune system is in reaction mode. Your dentist will also inspect the inside and outside of your lips and your jaw joint. Once the dentist asks you to pull out your tongue and say “ah,” they will be inspecting the back of your mouth for signs of swelling and discolouration. This is an important part of the screening process because many types of oral cancer can begin in this otherwise hidden area of the mouth. 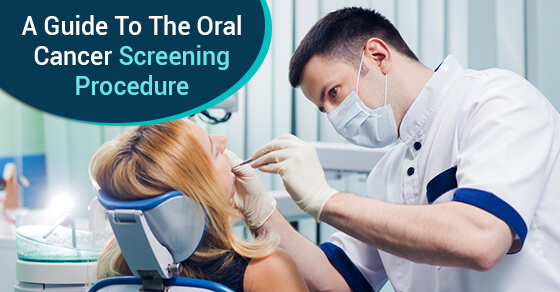 Your dentist will also conduct a visual inspection of your face during the oral cancer screening process. This process is designed to detect any changes in the symmetry of your face and to check for speech, swallowing and breathing issues. During the final part of the oral cancer screening process, your dentist will discuss your general day-to-day habits with you. They’ll ask you whether you’re getting the required amount of exercise for optimal health. They’ll also ask you about your alcohol consumption and tobacco use. This will help guide their future screening procedures and ensure you have the information you need to make healthy choices in the future. To discover more about the oral cancer screening procedure, give our office a call today. We’re ready to set up your appointment with a member of our team.